Hydrophobins are small secreted proteins that are present as several gene copies in most fungal genomes. Their properties are now well understood: they are amphiphilic and assemble at hydrophilic/hydrophobic interfaces. However, their physiological functions remain largely unexplored, especially within mycorrhizal fungi. In this study, we identified hydrophobin genes and analysed their distribution in eight mycorrhizal genomes. We then measured their expression levels in three different biological conditions (mycorrhizal tissue vs. free-living mycelium, organic vs. mineral growth medium and aerial vs. submerged growth). Results confirmed that the size of the hydrophobin repertoire increased in the terminal orders of the fungal evolutionary tree. Reconciliation analysis predicted that in 41% of the cases, hydrophobins evolved from duplication events. Whatever the treatment and the fungal species, the pattern of expression of hydrophobins followed a reciprocal function, with one gene much more expressed than others from the same repertoire. These most-expressed hydrophobin genes were also among the most expressed of the whole genome, which suggests that they play a role as structural proteins. The fine-tuning of the expression of hydrophobin genes in each condition appeared complex because it differed considerably between species, in a way that could not be explained by simple ecological traits. 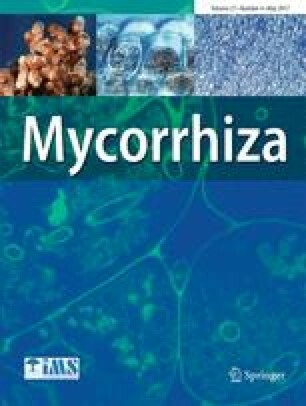 Hydrophobin gene regulation in mycorrhizal tissue as compared with free-living mycelium, however, was significantly associated with a calculated high exposure of hydrophilic residues. The online version of this article (doi: 10.1007/s00572-016-0758-4) contains supplementary material, which is available to authorized users. The authors are thankful to the Mycorrhizal Genomics Initiative for providing access to genomic and transcriptomic data. Hafida Lmalem and Francois Rineau are grateful to the BOF (Special Research Fund) from Hasselt University for financing their research. The authors also thank Tom Artois, Anders Tunlid and Michiel Op De Beeck for useful comments on the manuscript.